Arturo Checchi (Fucecchio 1886 - Perugia 1971). Biography. Arturo Checchi was born in Fucecchio in 1886. From a very early age he showed a talent for drawing and began to appreciate and love the Renaissance masters that Torello Bandinelli, his teacher at the technical college of his town of birth, encouraging him along the pathway of art, made known to him by showing him 19th century photographs and engravings. With a surprisingly sure hand, at twelve years old Checchi copied those 15th century masters that soon afterwards, when he moved to Florence, he would never tire of admiring and copying from life. When he was sixteen he began to attend the course on Ornamentation and Decoration at the Accademia di Belle Arti, Florence, where his teachers were the artists that influenced his development: Giovanni Fattori, Adolfo de Carolis and Armando Spadini. He was a student at the Accademia until 1905, and in the meanwhile he had made friends with Lorenzo Viani, a fellow student during this period, Oscar Ghiglia and Giovanni Costetti who introduced him to the stimulating cultural circle of “La Voce”; he knew the collector Gustavo Sforni and art critic Ugo Ojetti. In 1909 Galileo Chini, who was employed in the decoration of the cupola of the entrance pavilion at the VIII Venice Biennial, invited the young Arturo to help him with his work. In 1912 he exhibited three works at the “Mostra dei Bozzetti”, proposed by the Florentine “Promotrice”, where, the following year, he showed the painting “Fondo blu” (Blue Background) that aroused interest especially among the young. 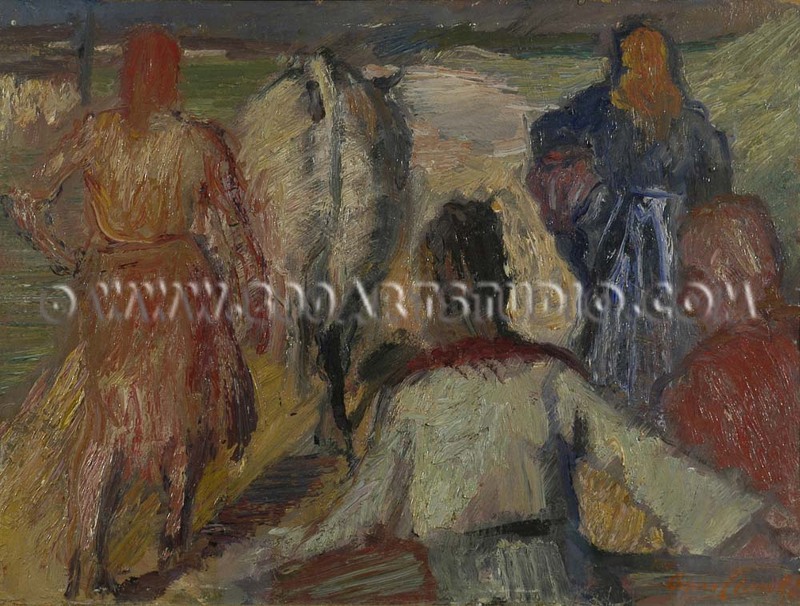 In this period he undertook a rewarding journey, studying in Germany from 1911 to 1913 where he got to know Secessionist art and Expressionist painting in particular. In addition, by visiting important exhibitions he broadened his knowledge of artist such as Gauguin, Cézanne and Van Gogh, some paintings of whose he had already been able to admire in Florence in some of the few local collectors’ homes. He returned from Germany leaving behind him a marriage to the German artist Charlotte Reider that had rapidly disintegrated. Returning to Florence, Checchi lived in close contact with the local artists but was autonomous and independent, never feeling the need to be part of a group or school. He worked intensely and exhibited his works achieving his first successes: in 1914 at the Roman Seccession his work “Coperta rossa” (Red Blanket) was purchased by the Galleria d’Arte Moderna in Rome, while “Orti fiorentini” (Vegetable Gardens in Florence) became part of Ugo Ojetti’s collection. From that time on the artist took part in numerous national exhibitions (the Venice Biennials, Biennial, Secession and Quadrennial in Rome, Tuscan and Umbrian council exhibitions), he was also showed at international art exhibitions (Prague, Berlin, Paris, Bordeaux, Zurich, New York) and in art competitions, achieving official recognition and also awards (The Ussi Competition, Roman Secession, etc.) both with works in black and white and oil paintings. Unable to dedicate all his time to his artistic career, Checchi was also heavily involved in teaching in order to earn a living. From 1925 he took up the teaching post of painting at the Accademia di BB. AA. Di Perugia, where his students, who all appreciated his talent for teaching and human relations, included the young woman Zena Fettucciari, who was to become the woman of his life and whom he married in 1930. The two artists enjoyed a very close relationship and an intense mutual love of art. Arturo Checchi taught at the Accademia di Perugia for more than a decade but had such serious problems with his job and for political reasons that in 1938 he suddenly left. Checchi moved to Milan and taught Figure drawing at the Accademia di Brera from 1939 to 1942, later moving to the Accademia di BB.AA. di Firenze, where from 1945 to 1949 he held the post of professor of painting. Arturo Checchi artist, designer, sculptor, engraver continued to work intensely and to exhibit until his death on 24 December 1971 in Perugia.